Aim: To assess the psychometric properties of the Elderly Nursing Core Set. Methods: Cross-sectional descriptive study; convenience sample composed of 427 individuals aged 65 years old or older. Results: Factor analysis of principal components allowed extracting 4 concepts, i.e., Self-Care, Learning and Mental Functions, Communication, and Relationship with Friends and Caregivers, which explained 82.25% of the total variance. Varimax rotation indicated a very good measure of sampling adequacy (KMO = 0.947), with Bartlett’s test of sphericity (X2(300) = 11131.28, p < 0.001) and an excellent Cronbach’s alpha value of 0.963. 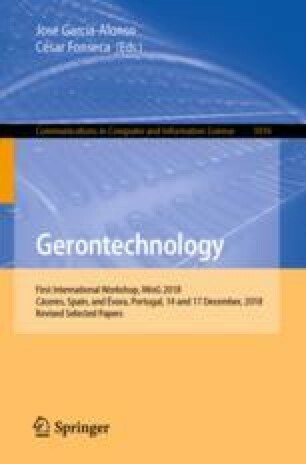 Conclusion: The Elderly Nursing Core Set exhibits excellent psychometric properties, i.e., consistency, reliability, and internal validity, for which reason it is recommended as a means of determining the nursing care needs of individuals aged 65 years old or older and assessing the outcomes of nursing interventions targeting that population.